Many American films about the pre-Civil Rights era depict black Americans as noble and long-suffering with whites equally one-dimensional: either hateful bigots or supportive do-gooders. 42 is not one of those films. 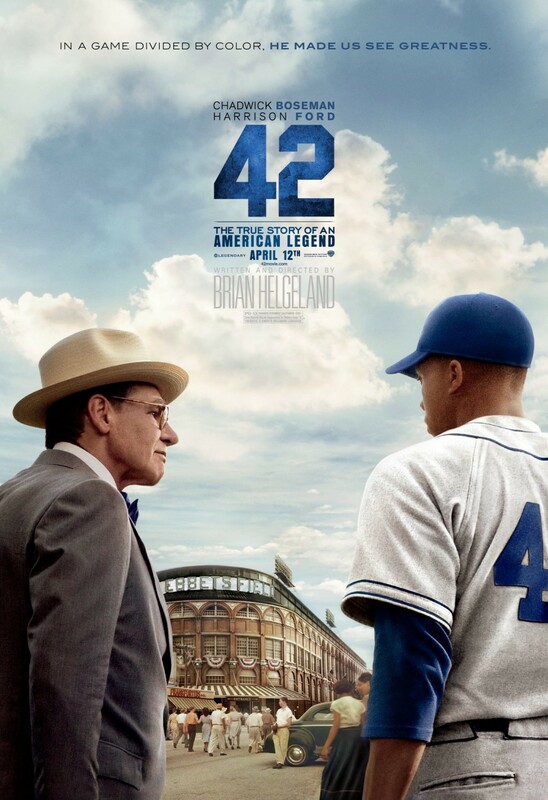 Brian Helgeland’s script traces Jackie Robinson’s first season with the Brooklyn Dodgers in 1947, as the first black ballplayer in the Major Leagues. But the film resists the trope of the Righteous Hero against Injustice. Jackie Robinson’s character is deeply human, a man who “resents racial segregation” and has the temper to prove it. Racism in this story is not an obstacle to triumph over. It’s shown for what it is—an ugliness that gets in the way of men who simply want to be men. And embedded in the film’s structure itself is a larger truth about racial inequality that can still unsettle white Americans—that in a racist society, blacks and whites are different because their experiences of the world are different. And the only way to bridge that difference is to be honest about it. The best example of Helgeland’s juxtaposition of black and white experience is the arc of how Robinson and teammate Pee Wee Reese handle public antagonism. Robinson never dignifies the virulent racism with so much as a remark, but the film’s lead, Chadwick Boseman, shows that it gets to him. You can’t be human and be unmoved by such hatred. After the film’s worst verbal attack from Phillies manager Ben Chapman, Robinson stalks off the field, through the dugout and into the tunnel. Alone in the darkness, a silhouette, he winds up and swings his bat. It splinters against the wall. And he releases the scream of a primal wound. This is what racism does to the soul. And Helgeland is a damn fine writer. In a late scene between Robinson’s teammate Pee Wee Reese (Lucas Black) and Dodgers’ executive Branch Rickey (Harrison Ford), Reese presents a death threat of his own regarding a game they’re about to play in Reese’s hometown. Rickey gets up from his chair, strides to his office file cabinet, and pulls out file after file after file thick with papers. “What are those?” Reese asks. But you can sense he already knows. He just doesn’t want to. And then he opens a file. All letters to Robinson, threatening not only the athlete but also his wife and even his newborn child. “Of course he knows about them. And so does the FBI,” Rickey says with impatience. Reese starts to get it. He starts to see the difference between his experience and Jackie’s. One threat to Jackie’s hundreds, perhaps thousands. “I just want to play ball.” Reese fumbles. In the next scene, the crowd again tries to shout Robinson off the field. And in the best Hollywood depiction yet of how to use white privilege, Reese jogs up to his teammate during the warm-up. Knowing he’s a hometown favorite, Reese chats with Robinson. Then he throws an arm around Robinson’s neck. Turns to the crowd. And lets them absorb the sight. The director cuts to a young white boy in the stands, shocked to see his hometown hero offer this gesture of affection to a black man. The boy—who had earlier joined in the epithets—falls silent. Robinson looks more amused and charmed than anything else. And Helgeland has made his point. This is one of the most moving films I’ve seen in a long time. And it delivers some much-needed honesty about what it’s really like to be the target of racism—as well as what it means to become aware of race privilege as a white. And I hope, just as Robinson was the first of many outstanding black American athletes, that this film heralds a more racially enlightened era in American filmmaking. One centered not on comfortable reassurances, but on delivering the truth, with all the force of a Robinson homerun.